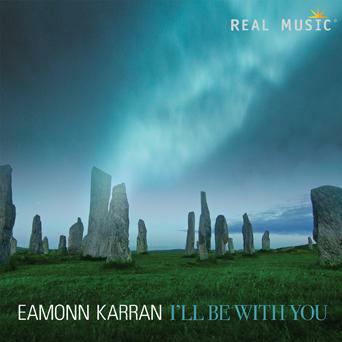 I’ll Be With You is the fourth release on the Real Music label from Irish pianist/composer/keyboardist Eamonn Karran. I have reviewed all four albums, but this one seems to be his most personal and expressive work to date. More than two years in the making, the album represents the journey Karran and his family have taken over the past six years. Quoting Karran: “It’s an album of colors, textures and emotions, a portrait of our lives.” In addition to Karran on piano and keyboards (synths), Erin Kelly provides vocals and Gabby Fitzgerald plays Uilleann pipes on some of the tracks. The thirteen pieces present a very pleasing blend of traditional Irish roots and contemporary musical sensibilities. The Real Music website lists this album as “music for grief and loss, rejuvenation, and stress relief,” but I can recommend it to anyone who loves beautiful music of a deeply emotional nature. I’ll Be With You begins with “The River,” a haunting vocal and instrumental piece mourning the loss of someone dear. Erin Kelly’s expressive voice is gentle as it conveys heartbreak as well as a ray of hope. “Guiding Light” is more ambient and ethereal, perhaps indicating a time of transition. Piano and voices enhanced with synth washes begin the piece, adding sax and guitars as it gradually builds and evolves. The title track is a mostly piano piece with rolling broken chords that are somber, but hopeful. The piece becomes more intense as more orchestration is added (flute, bass, guitar, choral voices and percussion), and then ends peacefully. “Morning Light” begins as a warm and serene piano solo, adding strings and voices with the piano always in the lead. “A New Dawn” expresses the warmth and optimism of a fresh start, intensifying with added orchestration and rhythms that become more cinematic. “Thought of Tomorrow” is a favorite. Piano, strings and voices paint a peaceful picture in shades of deep blue and gray. Graceful and deeply emotional, the poignant melody touches the heart. “Requiem” returns to a more ambient and ethereal sound. A requiem is a piece composed in honor of someone’s death, and this one is soothing and hopeful with vocals and colorful keyboard washes that suggest light and healing. “The Beginning” features award-winning Uilleann piper Gabby Fitzgerald along with piano and various synth voicings. Quiet and almost hymn-like, the entrance of the pipes lifts the piece skyward - gorgeous! “Mac Lir” translates as “son of the sea” and this piece has a lively sparkle as well as a calming ebb and flow—I really like this one, too! “Stand Beyond” is perhaps the most dramatic piece on the album, bringing it to a close with drums, flutes, a female voice, pipes and more. Very Celtic in sound, it seems to express triumph and moving forward. Eamonn Karran gets better with each new album, and I’ll Be With You is no exception. Recommended!